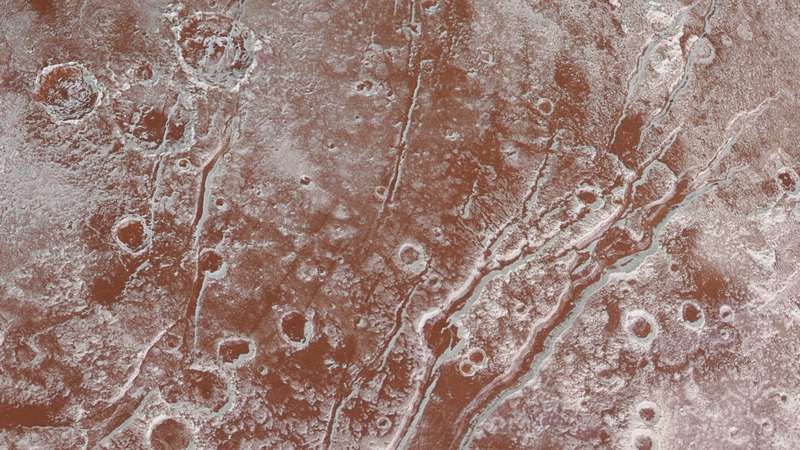 Combining data from two instruments on board the New Horizons spacecraft, NASA scientists have produced a detailed composite image of Pluto’s Viking Terra region. NASA has also released a photo of the Sputnik Planum region which it says is the sharpest view yet of the Plutonian surface. To make this image of Viking Terra, scientists from the New Horizons mission combined photographs taken by the Long Range Reconnaissance Imager (LORRI) with enhanced color data acquired by the Ralph/Multispectral Visible Imaging Camera (MVIC). LORRI took these photos at a distance of 31,000 miles (49,000 km) on July 14, 2015, when the spacecraft made its historic Pluto flyby. The new composite image shows features as small as 1,600 feet (480 meters) across, and the entire scene measures 160 miles (250 km) across. One of the many features that stand out in this image is the bright methane ices that appear to have condensed on many crater rims. You can see a series of dark red tholins in low areas—small soot-like particles that are created when methane and nitrogen react in the atmosphere. And if you look really closely, you can even see layering on the faces of steep cliffs and crater walls. The New Horizons team is particularly interested in the areas where the reddish material appears thick and where the surface appears smooth. It seems that the material has flowed into some channels and craters. Thick tholin deposits aren’t really mobile on large scales, which means they might be riding along with ice flowing underneath, or they may be blown around by Pluto’s winds. Regardless, it’s yet another indication that this minor planet features a complex, dynamic, and active surface environment. The darker region (at far right) suggests a change in composition or surface texture. And those raised, darker blocks at the cell edges might be dirty water “icebergs” that are floating in denser solid nitrogen. Here are some close-up perspectives. The pictures are part of a sequence taken near New Horizons’ closest approach to Pluto, with resolutions of about 250-280 feet (77-85 meters) per pixel – revealing features smaller than half a city block on Pluto’s surface. The images illustrate the polygonal or cellular pattern of the plains, which are thought to result from the convective churning of a deep layer solid, but mobile, nitrogen ice. The images shown here form a strip 50 miles (80 kilometers) wide and more than 400 miles (700 kilometers) long, trending from the northwestern shoreline of Sputnik Planum and out across its icy plains. They were made with the telescopic Long Range Reconnaissance Imager (LORRI) aboard New Horizons, from a range of approximately 10,000 miles (17,000 kilometers), about 15 minutes before New Horizons’ closest approach to Pluto. The images are six times better than the resolution seen on the global Pluto map that New Horizons obtained earlier.